Timothy Phillips celebrated his sixtieth birthday by hiking Spain’s Camino de Santiago. The almost eight hundred kilometer trek became a month-long test of physical stamina, with weather extremes, a range of fellow pilgrims, and hours of introspection that caused him to question his childhood, his life, and many long-held ideas and beliefs. These challenges shook loose the very foundations of his being. Timothy brings a photographer’s eye to detailed descriptions of the trek that appeal to all the senses and invites the reader to join him on his healing journey. For more information about the book and Timothy, or for updates and more photos by the author, please go to his blog, Camino De Tim. It’s true that life is linear, but the living of it is all over the map. In this memoir-in-vignettes, novelist Kevin Brennan (Parts Unknown, Yesterday Road) examines his life the way memories occur in the wild: in no particular order. Whether it’s recalling high school humiliations, ups and downs in love and romance, or unique interactions with the human race at home and abroad, Brennan both entertains and moves the reader with moments of unexpected poignancy and full-tilt humor. In No Particular Order is a deconstructed memoir, like no other because it looks at life as it really is — a kaleidoscope of individual moments. For more information about Kevin and his publications, as well as more about this new eBook, check out his blog, What the Hell. Margaret Mackey draws together memory, textual criticism, social analysis, and reading theory in an extraordinary act of self-study. In One Child Reading, she makes a singular contribution to our understanding of reading and literacy development. Seeking a deeper sense of what happens when we read, Mackey revisited the texts she read, viewed, listened to, and wrote as she became literate in the 1950s and 1960s in St. John’s, Newfoundland. This tremendous sweep of reading included school texts, knitting patterns, musical scores, and games, as well as hundreds of books. The result is not a memoir, but rather a deftly theorized exploration of how a reader is constructed. One Child Reading is an essential book for librarians, classroom teachers, those involved in literacy development in both scholarly and practical ways, and all serious readers. Margaret Mackey is Professor in the School of Library and Information Studies at the University of Alberta. She has published widely on the subject of young people’s reading and their multimedia and digital literacies. A voracious reader, she lives in Edmonton. At this moment (apart from moving house and closing my office), I’m just getting started on a project that has the potential to be very intriguing. In the fall I will be recruiting some undergraduates to create a digital map for me of a place that was very important to their early literacy. It can be a real-life landscape or a fictional one (acknowledging that some urban children don’t spend much time out of doors). I will invite them to annotate their map with any kind of records they can come up with – written comments, photographs, videos, audio, interactive ways to “travel” around the landscape, and anything else they can think of. I’ll interview them about the map: why they chose this landscape, what makes the annotations meaningful to them, what they remember more broadly about their literate lives at the time this map was meaningful to them. Pilot work has established that this method of approach can bring out expanded memories of an important stage in developing literacy; and while it is a tool to help articulate these memories, it also allows for some very eloquent forms of expression in its own right. I’m excited to get going on the full-stage project. The idea arose from the work I did for One Child Reading; I was very surprised to re-discover how important my own landscape had been to me and I began to wonder if it was the same for other readers. The pilot work suggests that the answer is yes. I am very happy to recommend a wonderful book called Lakeland: Journeys into the Soul of Canada. It’s by Allan Casey and was published in 2009. Casey talks about the huge significance of lakes to many, many Canadian psyches. He begins with his “own” lake in Saskatchewan and visits at least one lake in every province except PEI. Some of these are working lakes, others are cottage country lakes, and some are just wild. I haven’t been to every lake he mentions but I’ve been to a number of them, and I’ve also driven across Canada three times, which certainly gives anyone a strong sense of what a lake-bound country this is. I don’t think you would need this level of experience to enjoy the book, but it would certainly help a reader if they loved at least one lake, wherever it is. Sharon Butala was previously featured on Reading Recommendations in Oct. 2015. She’s back now to tell us about a new non-fiction book just being released. An intimate and uplifting book about finding renewal and hope through grief and loss. In the tradition of Joan Didion’s The Year of Magical Thinking, Diana Athill’s Somewhere Towards the End, and Atul Gawande’s Being Mortal comes a revelatory new book from one of our beloved writers. When Sharon Butala’s husband, Peter, died unexpectedly, she found herself with no place to call home. Torn by grief and loss, she fled the ranchlands of southwest Saskatchewan and moved to the city, leaving almost everything behind. A lifetime of possessions was reduced to a few boxes of books, clothes, and keepsakes. But a lifetime of experience went with her, and a limitless well of memory—of personal failures, of a marriage that everybody said would not last but did, of the unbreakable bonds of family. Reinventing herself in an urban landscape was painful, and facing her new life as a widow tested her very being. Yet out of this hard-won new existence comes an astonishingly frank, compassionate and moving memoir that offers not only solace and hope but inspiration to those who endure profound loss. Often called one of this country’s true visionaries, Sharon Butala shares her insights into the grieving process and reveals the small triumphs and funny moments that kept her going. Where I Live Now is profound in its understanding of the many homes women must build for themselves in a lifetime. I have been invited to be a keynote speaker at a small conference in Boise, Idaho whose theme is “Wallace Stegner and the Consciousness of Place.” It is hosted by the Idaho Humanities Council, will be held at the Boise State University July 16-21, and is for K-12 teachers. I’m invited because of my connection to Stegner and his family home in Eastend, Saskatchewan, a place about which he wrote Wolf Willow: A History, A Story, and a Memory of the Last Plains Frontier. As I too, have written about that world but from a purely Canadian perspective, we share a lot, but we also diverge because he went back to the United States to live out his long life, and because he was a man, and didn’t see the Western world quite as I do. I am truly looking forward to this adventure, and not least because years ago on a writing trip, I spent a night there and did a reading and thought I’d never seen a place in the US I thought prettier or more green or more peaceful. I have always wanted to see it again. And besides, once you begin to age you start to see that the small adventures are often much richer than the big ones, that tends to just knock you for a loop. I was a sales rep for Ron Smith’s publishing company back in the day, and was shocked to learn recently that Ron had suffered from a massive stroke a few years ago. The good news is that I discovered this news when reading an announcement for this book Ron wrote about the experience and his recovery. So I’m now very pleased to be able to bring attention to readers around the world about this very important book by Ron Smith. Quick description: “What is a stroke?” This is the question that plagues Ron Smith as he emerges from the carpet bombing of his brain. The Defiant Mind: Living Inside a Stroke is a first-person account of a massive ischemic stroke to the brain stem. Smith takes the reader inside the experience and shows how recuperation happens ― the challenges of communication, the barriers to treatment, the frustrations of being misunderstood and written-off, the role of memory in recovering identity, the power of continuing therapy, and the passionate will to live. Full of arresting anecdote, enlivened by a vivid and vigorous style, the book tells of successes and failures and draws on the newest research in stroke treatment. This is a necessary book for stroke survivors still dealing with the effects of their trauma and for care-givers, vital to the process of recuperation, who feel hampered and harried by concern and confusion. The book is a caring companion, offering support to people navigating the fear and bewilderment that accompanies a stroke. For medical professionals, the book offers insights into the workings of the brain, the power of the brain to heal, critiques of conventional limits imposed on therapy, and suggestions for ways to improve care. More than an evocative memoir, more than a breathtaking journey out of stroke and back to a literary life, The Defiant Mind is a beautifully written love story; it is a glimpse inside the tender and fulfilling relationship between the author and his wife. Smith makes clear that defiance (with unconditional support) is the first step to making hope a reality. Ron Smith the author and editor of several books. For close to forty years he taught at universities in Canada, Italy, the States and the UK. In 2002 he received an honorary doctorate from the University of British Columbia and in 2005 he was the inaugural Fulbright Chair in Creative Writing at Arizona State University. In 2011 he was awarded the Gray Campbell Award for distinguished service to the BC publishing industry where he has played an essential role in the growth of literary, historical and public policy publishing. He now lives with his wife, Patricia Jean Smith, also a writer, in Nanoose Bay on Vancouver Island. Anything and everything by John Berger. I particularly like A Fortunate Man and here is where we meet. What is your latest release and what genre is it? Juliet’s Answer is a memoir. Published by Simon & Schuster in Canada and the United States, in May it will be released in Australia and New Zealand, Spain (Spanish translation) and China (where the story of Romeo and Juliet is quite famous). Quick description: I taught Shakespeare to high school students for more than twenty years but when my heart was unexpectedly broken, I did something unusual. I went to Verona, Italy, to help answer the famous letters to Juliet. I was the only male among the secretaries of Juliet (a group of Italian women who have been answering the letters for decades). And, of course, I discovered a few things there that completely changed my life. An author, musician and documentary film maker, Glenn Dixon has travelled through more than 75 countries and written for National Geographic, the New York Post, The Walrus, The Globe and Mail, and Psychology Today. He holds an M.A. in socio-linguistics and his second book, Tripping the World Fantastic, was shortlisted for the W.O. Mitchell Award. A high-school English teacher for 20 years, he left that to become a full time writer. And reviews for Glenn’s book have already begun rolling in! Here’s a review that was just published in Canada’s The National Post. Also, Anne Logan has posted a review to her blog, I’ve read this. I’ve only just begun the next book, which will be a novel. My thinking is that I’ll never have a true life story to rival Juliet’s Answer again. That was one in a million. My book has been described as a male version of Eat, Pray, Love. The thing is, I didn’t like that book very much. On the other hand, I recently read The Signature of All Things by the same author – Elizabeth Gilbert. It’s a novel and is absolutely brilliant. That one should have been the big best seller. It reminds me a little of Jane Eyre. It has that kind of classic quality. Quick description: Timothy Phillips celebrated his sixtieth birthday by hiking Spain’s Camino de Santiago. The almost eight hundred kilometer trek became a month-long test of physical stamina, with weather extremes, a range of fellow pilgrims, and hours of introspection that caused him to question his childhood, his life, and many long-held ideas and beliefs. These challenges shook loose the very foundations of his being. Timothy brings a photographer’s eye to detailed descriptions of the trek that appeal to all the senses and invites the reader to join him on his healing journey. I was born in London, England. After schooling I embarked on a career in the hospitality industry working in luxury hotels and restaurants in London and Paris. Further opportunities took me to Toronto, Vancouver and Stratford, Ontario. In 1992, (the big midlife crisis hit at age 42) and I changed career, went back to school to study the healing arts and became a shiatsu and registered massage therapist. That healing has become my healing. I love and am enriched by the experience of travel to all parts of the world, sampling their food and culture along with human interaction. I am drawn to examine other healing journeys as part of my ongoing Camino. Travel plans this year are taking me to the UK, to Japan, to the southern USA and to Mexico and these experiences will form the basis of my next writings. Therapy by David Lodge (Penguin 1995) and I am enjoying the quirkiness of the character telling the story. He reminds me of an English version of Woody Allen – equally as neurotic but with an incredible sense of human absurdity. Quick description: A daughter is forced to confront the uncomfortable truths about her mother’s seemingly ordinary life. By trying to make sense of the past, will she feel able to move on with her future? Honest yet unsentimental and told with abundant love and compassion, Castles in the Air is a profoundly moving portrait of a woman’s life, hopes and dreams, in an era when women couldn’t have it all. I’m an author, memoirist, novelist and screenwriter who co-writes thrillers (with Sean Cubitt) as Lambert Nagle. I spent fifteen years in the film and TV industry, working for companies such as the BBC and Walt Disney. But I’d always wanted to be a writer. I’m working on a second thriller, Nighthawks, set in Italy and is about the trade in looted antiquities. On our recent annual holiday, we went to Costa Rica and I took with me Piers Alexander’s The Bitter Trade, although set in London, is about a coffee racketeer. It’s a rattling good yarn, is beautifully written, and the author has a wry wit. Quick description: In Trials Elsewhere, R. Matthias vividly describes his experiences as a 21st century traveler. Moving from Canada to Washington D.C. to take on the inner city, Matthias then finds himself invited to apply his skills and idealism in The Republic of the Gambia. Working first for a human rights NGO and then for a Gambian-owned Internet service provider, he begins to question his conceptions of how the world works — is the Western way of doing things viable in other parts of the world? Is the Western way of work even a good idea? Is there any real value in idealism as Westerners understand it? As he ponders these questions Matthias is cursed at a wedding, survives a coup d’état, avoids the state’s secret police, wanders for a year stateless without a passport or way home, and is sentenced by a tribal court. Matthias’s experience in West Africa increasingly becomes an unpredictable adventure. R. Matthias is currently holding a Goodreads Giveaway for 10 copies of his print book, open to members from the US and Canada to enter until Jan. 31. Robin started his library career working at the Washington DC Public Library as Head of Intranet Development. Following that, he lived many years overseas, primarily in West Africa, building IT infrastructure in The Republic of the Gambia, Sierra Leon, Guinea Bissau and Guinea Conakry. He also worked in Ethiopia and Uganda on a telehealth project on behalf of The Hospital for Sick Children in Toronto, Canada. I’m currently working on a collection of short stories primarily concerning my life while I worked in Washington DC. I’d strongly recommend Wallace Stegner’s Collected Stories. Each one is a wonderful insight into some aspect of the relationships young people are a part of. 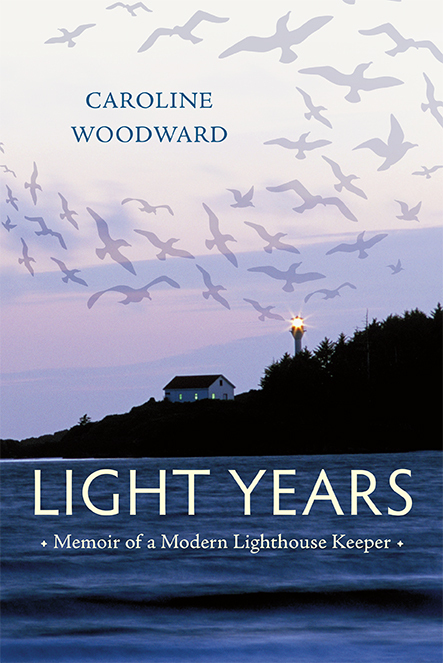 I have known of Caroline Woodward’s writing since the early 90s when I was a bookseller in Calgary. She published Disturbing the Peace and Alaska Highway Two-Step with Polestar Press of Winlaw, BC. Our careers have managed to intersect a couple of other times, as Caroline opened a bookstore in the West Kootenays of BC – I had already operated a mail order bookstore in the East Kootenays – and then as publishers’ sales reps for the same agency, with Caroline travelling about schlepping books on Vancouver Island and the northwest coast of BC, and me in Alberta. Polestar was always one of the publishers we both represented. And we are also now writing and publishing books! I was so pleased to see that Caroline had published Light Years, and it found a home with one of the other publishers we had both represented. Here she is to tell you more about this new book. Quick description: The very true story of a writer who always chose adventure over security, love over logic, and who (naturally) quit her best job ever to go off with her equally peripatetic husband to live at a lighthouse and write all the stories she always wanted to write, including this one. Caroline Woodward grew up on a B.C. Peace River homestead and began her writing career as a weekly columnist for two years at the Alaska Highway News while still in high school. While toiling at many white, blue and pink collar jobs ever since then, she wrote eight books for adults and children (so far). 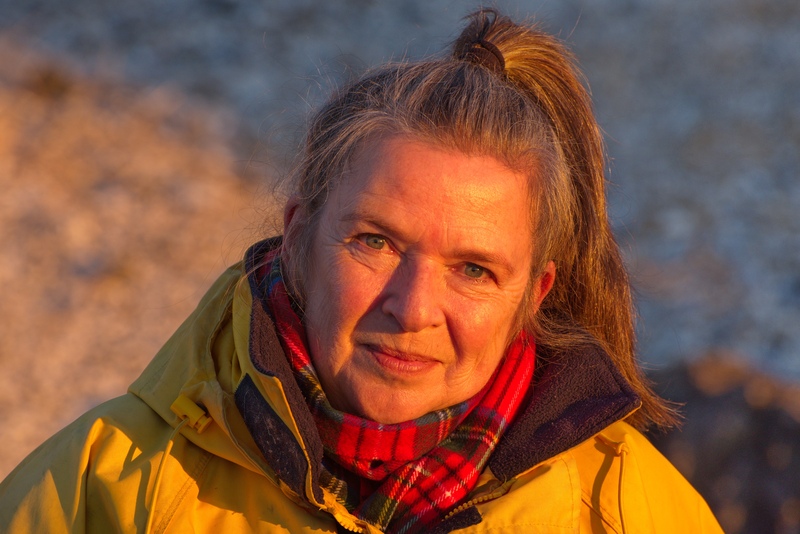 She now lives, works as a relief lightkeeper, and writes like a spring unsprung from her home-base at the Lennard Island Lightstation near Tofino, B.C. I have two nautical picture book mss. for little ones on the go at the moment, with photographs by Jeff George, who also contributed most of the beautiful photos for Light Years (and is also a writer and my husband, a trifecta of talents!) I have about three other books in various stages of readiness so when I get stuck with one genre or project, I move on to another. It’s amazing how much manuscripts improve when left alone for a few months or even years!